Dust roiled around us, a khaki African veil, as Jonathan pushed the Land Rover up past 50 kph—the fastest we'd been able to go since we'd left Nairobi on the way to Magadi and the Great Rift Valley, not far from the Tanzania border. 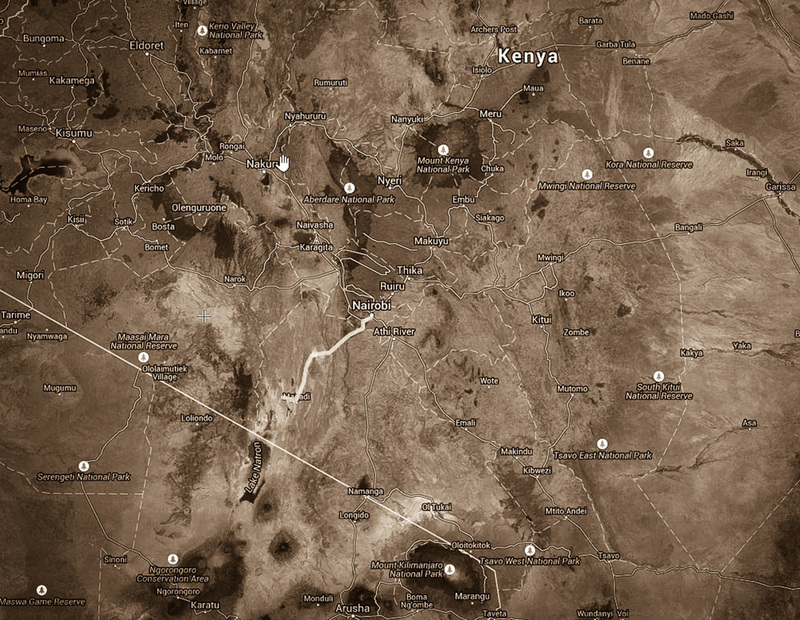 Like in most African countries—from Egypt to Zambia—the dirt roads of Kenya are where you can travel fastest. If there are paved roads, they are so pocked with potholes and packed with pedestrians, bicycles, and livestock that locals have a saying: "You know how you tell a drunk driver in Africa? They are the only ones driving straight." It was early October 2011, the dry season between the short and long rains in East Africa, and we were on our way to help host a law enforcement training workshop for the South Rift Game Scouts through our small charity, ConserVentures, whose mission is to promote exploration of the planet and conservation of its natural and cultural resources. The South Rift Game Scouts are an anti-poaching squad protecting the abundant wildlife of the Maasai nature conservancies in the southern Rift Valley; they receive no funding or support from the Kenyan government. 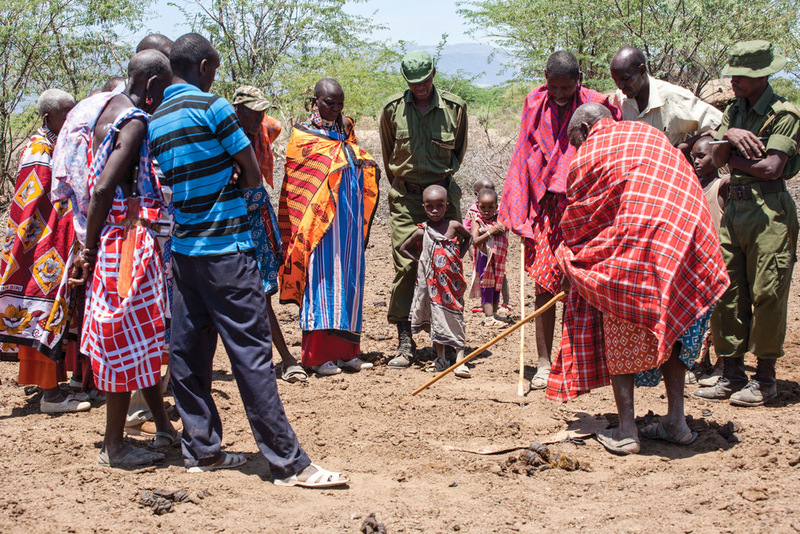 Since 2006 we have been working with the African Conservation Centre in Nairobi to develop support for community-based projects, especially those of the Maasai whose territories overlap the most wildlife-rich landscapes in East Africa. The Maasai are among the most famous of Africa’s people, known for their distinctive red robes called shukas, their pastoral traditions, and their history as fierce warriors. For 300 years they ruled a broad swath of the Rift Valley region in what is now Ethiopia, Kenya, and Tanzania. As semi-nomadic pastoralists originating in the upper Nile, they moved their cattle in response to rainfall patterns, mimicking the migration routes of wild game and leaving little or no permanent impact on the land. When they needed more cattle, they raided other tribes. In the early 1900s, British colonial officials exploited the nebulous and fractious nature of Maasai leadership to craft several treaties that drastically diminished existing Maasai territories and further curtailed the ability of tribal members to move their herds with the rains. The increasingly forced sedentariness of Maasai life became a challenge that has yet to be fully solved. Despite this loss of dominance and territory, the tribe clung to its warrior culture. While the British discouraged (with mixed success) raiding other tribes, for at least the first half of the 20th century a young moran, of the warrior class, was free to test his courage in their time-honored tradition—by facing down and killing a lion while armed with just three implements: a double-edged machete, a spear, and a buffalo-hide shield. The oblong shield, or o’longo, was usually three to four feet tall, and typically made from rigid Cape buffalo rawhide lashed with lighter, flat goathide strips to a bent wood perimeter frame. A heavier vertical center strut provided reinforcement and a grip. The front was decorated with an intricate pattern called sirata in various combinations of red, white, yellow, black, and blue-gray. The shield had a secondary significance just as important as its primary use in defense against an enemy spear thrust or a lion’s charge. The designs on the face were highly codified and revealed many details about the bearer, from his region and clan to his prowess as a warrior. Furthermore, the shield was the one possession commonly handed on to a chosen successor—not, as one would expect, a son, but more often a young man in a succeeding age group. Thus a shield would be passed down strictly on merit rather than mere accident of birth. Even marks of personal bravery earned by the original owner would be painted over, so the new bearer might strive for his own. The image of a Maasai moran crowned with an ostrich-feather or lion-mane headdress, spear in one hand, the other resting on a decorated shield, is probably what 90 percent of the world pictures when asked to conjure an image of an African warrior. How could it be, then, that this shield—an implement so iconic its image is central on the Kenyan national flag—has not only disappeared from use, but is almost lost to memory among what is already nearly two generations of young Maasai men? It happened so gradually that no alarm was raised until it was almost too late. No longer able to move herds of cattle where they pleased through country well-populated with lions, and no longer able to raid freely, the need to carry a bulky and heavy shield faded. In 1977 Kenya banned all hunting, making even the pursuit of cattle-killing lions around permanent villages a crime—and also cutting off access to wild buffalo hide. Faced with all this, and forced increasingly into a modern monetary system, many Maasai men unsentimentally sold their shields to tourists or collectors. Other shields dried and curled in the corners of huts until simply discarded. Any vague intentions to construct new shields were easily put aside for more pressing priorities, such as surviving increasingly more frequent and severe droughts. By 2003, when the photojournalist Elizabeth Gilbert published her book Broken Spears, not a single one of her contemporary portraits of Maasai men included a shield. Even the series of images capturing a traditional lion hunt carried out by a group of 14 warriors in Tanzania in the early 1990s reveals not a single shield, despite the extremely hazardous nature of their endeavor. 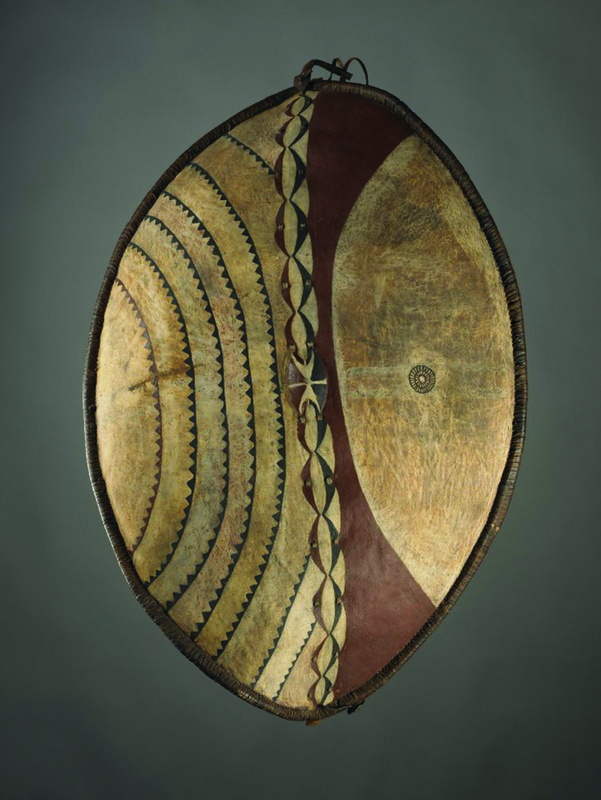 Like an endangered species lost to the wild and found only in zoo exhibits, it seemed the Maasai shield had disappeared from the world except for those kept under glass and fluorescent lighting in museums, or sold now and then through high-end tribal art dealers. And there things might have remained—and ended—but for the foresight of Tonkei ole Rimpaine, a Maasai elder in Kenya’s South Rift Valley. Now in his 70s with a son serving in the South Rift Gamer Scouts, Rimpaine had been a shield bearer and honored warrior in his youth in the Olkiramatian region, between Lake Magadi and the Rift Valley escarpment in southern Kenya. Rimpaine spent an afternoon talking with us through an interpreter about his time as a warrior—serving with his age-mates as guards for the home bomas, patrolling against cattle-rustling raids from other Maasai groups, going on a few raids themselves, and hunting lions, the ultimate test of bravery. Rimpaine wondered if such a workshop could inspire a new generation of young Maasai men to renew a much-needed pride in their cultural history. A renaissance in natural and cultural heritage conservation is growing in the South Rift, led by people like Rimpaine and John ole Kamanga, who helped found the South Rift Association of Land Owners. Kamanga notes that, for the Maasai, culture and nature are inextricably tied. Preserving one enables preservation of the other. Rimpaine explained to us that while the spear and shield are powerful symbols, the warrior culture was never simply about raids and hunting. Thus there is a very real connection between a Maasai warrior of a century ago who might have hunted lions to protect his cattle, and a Maasai warrior of today who becomes a game scout to protect lions because tourists now pay to see wildlife. The scouts are helping to preserve a landscape in which both wildlife and traditional Maasai culture can survive and flourish, while they meet the challenges of a modern economy. Maasai warriors then . . .
As the workshop commenced, it became clear that shields were not the only things being crafted. The fascination and growing excitement of the young men who assisted the old warriors also crafted a bridge that spanned not just one, but two generations. Across that bridge flowed stories, history, knowledge, and pride. Just as the Maasai shield is an important symbol of the past, this workshop to faithfully recreate them had become a symbol of the future. Left: A young cow is brought in for traditional slaughter. We had paid for a bull, but they are so valuable, the community probably hoped we wouldn't notice the difference. Slideshow below: A large, sharp knife is used to quickly pierce the back of the skull and sever the spine. The dewlap is cut to form a bowl in which blood pools. The men, young and old, take turns drinking from the fresh blood, an important Maasai tradition. Word had gotten around about the event, and young men and elders showed up to participate (and enjoy marrow bones and roasted meat later). Images below: The blood was carefully collected for use in the shield-making. Blood is used to create the paint for ochre and black colors; milk is used to create the blue-gray and white colors. Two of the men took turns stirring the blood until it cooled, to keep it from coagulating. 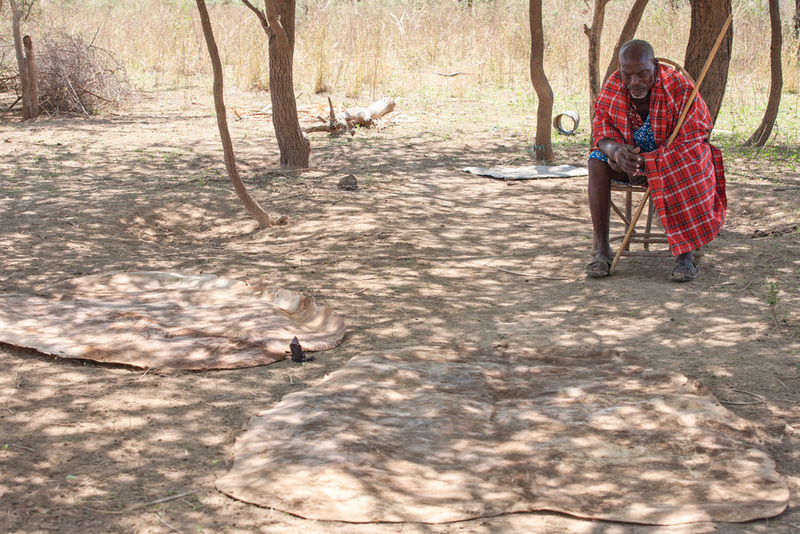 The women took over preparation of the hide, staking it out in the hot sun, coating it with ash, then burying it in the ammonia-rich dung at the center of a boma, the traditional thorn-fenced circular enclosure in which the semi-nomadic Maasai build their small mud-and-dung homes. Above: Gathering stout Cordia sinensis wood for the central handle of the shield, and supple twigs from the same plant for the outer frame. Below: Goatskin was laboriously cut into strips to bind the hide to the frame and handle. 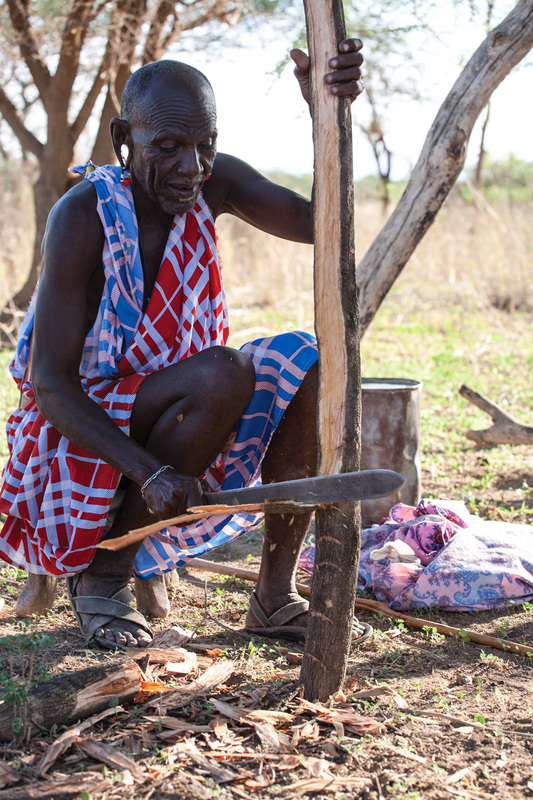 The cow blood was saved in several old bottles and used to mix the red ochre (a mineral collected in the Rift Valley) into red paint and charred cow and wildlife bones into black paint. Fresh cow milk is used to mix the white (limestone) and blue-gray (charred marrow) for paint. We produced a 110-page book documenting the entire process. You may order print copies at MagCloud.com or click the image at right to download a free PDF.